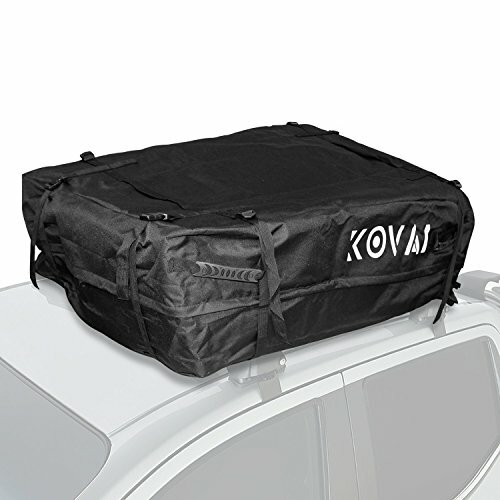 Load up your vehicle with ample luggage space with this roof top cargo carrier by Kova Gear. This luggage carrier can be easily attached to the roof rack of vehicles like cars, trucks, vans, and SUVs, and can be used for road trips, vacations, transporting equipment, etc. It is made from high quality weatherproof materials, meaning superior protection for your luggage against rough weather conditions like rain, wind, snow, etc. This rooftop cargo carrier bag is equipped with sturdy nylon straps to securely tie down the bag to the roof rack. These buckle straps make it really easy to install and take off the bag. The zippers are highly durable against rough use. The soft material of the bag allows for easy folding and storage when not in use. The premium grade material will not damage the vehicle's paint and finish. This rooftop cargo bag is a wonderful combination of style, robust design, and great usability. Superior Quality Rooftop Luggage Carrier - Perfect for all vehicles like cars, trucks, vans and SUVs, this non-slip roof top luggage carrier offers highly reliable, safe, and secure luggage space. Weather Proof - Made from weather proof materials to protect your luggage from all weather conditions like heavy rain, snow, wind, etc. Soft yet Rugged Construction - While the soft material makes it easy to fold and store the bag when not in use, the rugged design guarantees complete protection of luggage from rough and tough outdoor conditions. Sturdy Tie-Down Straps - Features multiple heavy-duty nylon straps to securely tie the bag to the vehicle's rooftop rack. If you have any questions about this product by Kova Gear, contact us by completing and submitting the form below. If you are looking for a specif part number, please include it with your message.